Combining DK's respected three-level reading scheme with the ever popular DC Comics super hero Batman, Batman: Adventures of the Dark Knight will help kids learn how to read - and learn how to love reading. Delve into the dangerous world of the Dark Knight and discover how he became the World's Greatest Detective. Get the lowdown on his arsenal of weapons and gadgets, his fantastic fleet of bat vehicles and the secrets of his Batcave. You can learn how he always stays one step ahead of Gotham City's strangest and deadliest villains, like The Joker, The Penguin and Harley Quinn. DK Reads are levelled into stages to help every child progress and become a confident reader. They feature engaging, highly illustrated topics with true kid appeal. The adventure-packed narrative is supported with interactive genre spreads that encourage children to access and interpret information from a range of sources and develop strong comprehension skills. 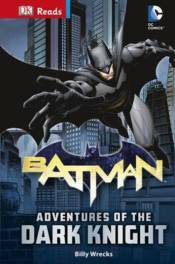 Batman: Adventures of the Dark Knight is a Reading Alone level Reads, perfect for any fan of the Dark Knight. Copyright (copyright) 2015 DC Comics.